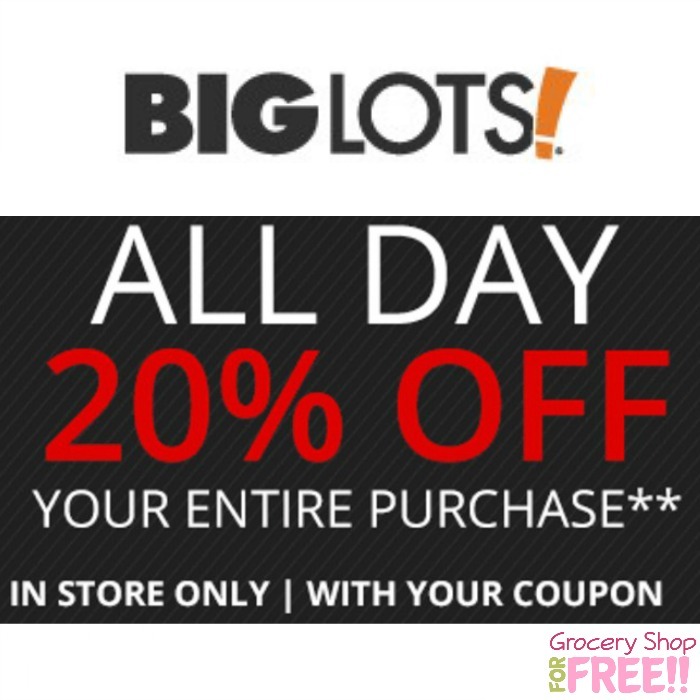 Big Lots 20% Off Coupon! Big Lots always has some really good prices, so when you can add a coupon to it, it’s always nice! You can grab this 20% off coupon for Buzz Club reward members and use it Friday and Saturday 1/27/17 – 1/28/17. Select Stores Only: Missed Friends & Family due to the storm? Join Big Lots for our make-up days, Friday, January 27 with Rewards Card, and Saturday January 28 with coupon. Not valid online. Be sure to check out the current Big Lots deals before you go! Coupon valid ONLY in select stores affected by storms the weekend of 1/21/17 thru 1/22/17. Promotional offer valid IN STORE ONLY at select Big Lots stores on pre-tax purchases. Limit one coupon per customer, per transaction. This offer does not apply to previous transactions, price holds, non-purchases such as rentals, deposits, charitable donations, purchases of milk, dairy products, eggs and/or purchases of gift cards. Cannot be used in combination with any other offer, coupon, discount or associate discounts. Value is forfeited if item is returned. By attempting to redeem this offer, user unconditionally agrees that decisions of Big Lots are final on all manners of interpretation, fact and procedure with respect to this offer. Valid only on in stock goods. Void where prohibited. No cash value or cash back. Coupon may not be sold or transferred. For Buzz Club Rewards members, in store offer valid all day 1/27/17, open until close. To redeem in store, present Buzz Club Rewards card at checkout. For all customers, in store offer valid all day 1/28/17, open until close. To redeem in store, present coupon to cashier at checkout. CASHIER: To apply discount, scan this coupon. Not a Rewards member yet? Sign up now, it’s FREE!